Back in the day, the name Rolex conjured up images of rugged professional watches, hardy tool-like models for those venturing out into the wildest extremes, whether at the top of the world or diving into the abyssal depths. More recently, it has become associated with notions of luxury, expense and opulence—worn as symbols of success and achievement. It was a conscious effort by Rolex to change persona, a well-thought-out tactic to survive the worst of the quartz crisis and set themselves up as the ultimate aspirational purchase rather than a merely utilitarian one. The shift in direction has led them down some previously unexplored paths, with a completely different type of clientele; the sort of people who would never be satisfied with anything understated or run of the mill, but who wear watches for one reason and one reason only—to stand out. 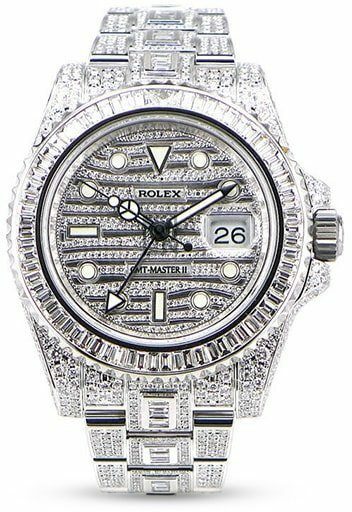 With money no object for this new breed, the shackles have been lifted and Rolex has been freed up to create some extraordinary, and extraordinarily expensive, pieces of flamboyant excess. Below, we will take a look at some of the most outrageous. Of all Rolex’s professional models, it is their world-beating chronograph which has been issued in the widest number of guises. In the standard lineup you will find examples crafted from each of the brand’s three flavors of gold, as well as the shimmering whiteness of their 950 platinum. There are gem-set hour markers, distinctive dials of mother-of-pearl and a host of other extravagances that belie the Daytona’s true origins as the definitive racer’s watch. Released in 2004, the ref. 116598-SE Leopard Daytona, alternatively known as the Tiger Lilly, is…well, it’s quite hard to put it into words to be honest. 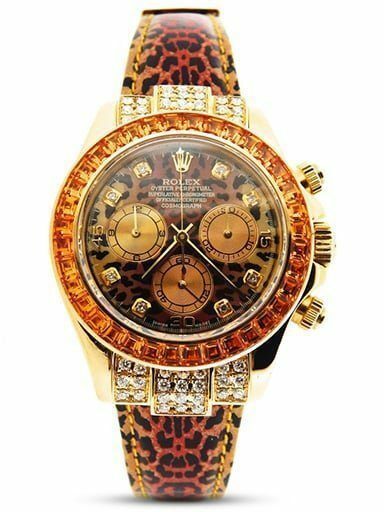 Taking the spotted markings of its big cat namesake as a motif, the dial and bracelet are both dappled in orange and black. The bezel is encrusted with 36 cognac sapphire baguettes and the 18k yellow gold case is strewn with 48 brilliant cut diamonds. The trio of sub counters are finished in a flat gold, without the contrasting outer rings found on some models, and the indexes have also received the diamond treatment. The effect overall is positively stunning, making the recently released Rainbow Daytona, with its multicolored surround and Everose case, look like the watch of choice for the average mousey librarian. Somewhere underneath it all is the same Cosmograph we all know and love, still the grandest stopwatch money can buy. Driven by the in-house Cal. 4130, its vertical clutch arrangement gives it incredibly precise starts and stops, with none of the hand judder of horizontal systems. The screw down pushers have been relentlessly tested to offer exactly the right amount of finger resistance, and its 28,800vph frequency means it can time to 1/8thsecond. It even has an Oyster case, waterproof down to 100m, should you feel the need to take a $71,350 watch for a swim. It may well be a world away from its natural home of the endurance racing event, but there’s no denying the Leopard Daytona is one watch that will get you noticed. This utterly astonishing version of Rolex’s luxury travel companion instantly became the most expensive watch they had ever released, clocking in at $485,350 when it was launched in 2007. No longer in production, its price on the pre-owned market has since risen even higher. Today, you’ll be lucky to find one for less than half a million. The numbers certainly explain some of its reported client list. Brad Pitt is apparently in possession, as is former soccer player and current clotheshorse David Beckham. Neither is known as the particularly shy and retiring type, and the GMT-Master II Ice is similarly not one for hiding its light under a bushel. Spectacularly blinged-up, there is the better part of 30 carats of diamonds awash on nearly every inch of the watch. The white gold case and lugs are fixed with 79 of the gems, round cut and hand placed into custom settings, and there are acres of stones covering the entirety of the three-link bracelet. The bezel, usually the signature element of the GMT series, has lost both its rotation and any two-tone color scheme, replacing it with a further 44 baguette cut diamonds. But it is the dial which has the most visual appeal. Scores of tiny glimmering gems are set in waves across the face, lending it a striking aesthetic. The hands, lume-filled and Mercedes-style, have been given a black outline to aid legibility against the sparkling background. Like the Daytona, all the glitziness is on the surface, leaving the mechanics behind it all well alone. The Cal. 3186 is still in use in some models in the contemporary lineup, although it has started to be phased out in favor of the upgraded Cal. 3285. The 3186 was itself an improvement on the older Cal. 3185, bringing with it a Quickset date function and the Parachrom Bleu hairspring. Does any of that really matter? Of course not. No one is parting with the sort of money commanded by the GMT-Master II Ice because they are in need of accurate timekeeping and dual time zone capability. This is, again, a watch designed to amaze and showcase the wearer’s net worth, and it does both in the most outlandish way imaginable. Whether its your particular brand of vodka or not, there is no ignoring it. Of course it’s all relative, but in comparison with the two other models on our list, the ref. 81405RBR could almost be described as discreet and unassuming. One of the Pearlmaster family which debuted in 1992 as a more exuberant take on the venerable Datejust, the series is renowned for its use of the highest quality gemstones, set in exclusively precious metal cases. The range now comes in two versions; a 34mm and a recently introduced 39mm, with the 29mm from the original series since discontinued. This model is from the former, with its midsize pink gold case barely visible under its head to toe diamond decoration. Bar the winding crown, every square millimeter is covered in dazzling rocks. The encircling bezel has 32 of the largest, with similarly proportioned stones in twin lines around the length of the five-link Pearlmaster bracelet. The center and outer links, along with the elegantly curved lugs, are likewise festooned, in varying hand-shaped sizes. The dial is paved across its entire surface, only leaving room for the date aperture and the ‘Rolex’ and ‘Datejust’ text at the 12 and 6 o’clock. Everose gold Roman numerals are applied on top. Inside, the Cal. 2236 provides the power, one of the newer generations of movement from the brand, which have started to include silicon-based hairsprings for their antimagnetic properties and shock resistance. Rolex’s Syloxi components actually have a unique geometry, allowing them to compensate for gravitational variations, ensuring a completely unvarying performance in any position. The Cal. 2236 was the first to introduce the new technology, which is slowly being adopted across the range. Of our three, it is the Pearlmaster which has the most wearability, helped by the warmth of its pink gold case just peeking through between the bucketfuls of diamonds. Although still ranking high on the bling-o-meter, it is not in the same outrageous league as the GMT and most definitely nowhere near the psychedelic Leopard. A beautiful example of the gem setter’s art, the ref. 81405RBR is Rolex at its most jewelry-like, and a fine addition to an outstanding portfolio.